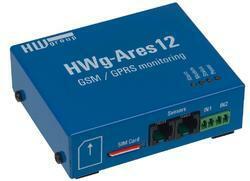 Ares12 and 14 is a remote environment monitoring solution that can be used at any place with GSM coverage. Contains a battery for several hours of backup. Alerts to power failures by email or SMS (up to 5 phone numbers). Data can be read into HWg-PDMS (free software), connected to a Web portal or to a SCADA/NMS system. Ares collects and records data from connected sensors. Stored values can be sent to any system. Values outside of a specified range trigger an e-mail (over GPRS) or a text message (SMS) to multiple recipients. Ares12 differs from HWg-Ares14 in the number of supported 1-Wire UNI sensors. Both versions include two digital (dry contact) inputs and support temperature, humidity, illumination, voltage and other 1-Wire UNI sensors. Measured data can be natively imported into HWg-PDMS, a Windows application. Data can be sent directly to a server, or attached to a periodic e-mail report. The “HWg-Ares12 Tset” quick start set contains a temperature sensor, an universal power adapter and an external antenna. Ares12 cooperates with the SensDesk web portal. A special driver is needed for connecting to a NMS. HW group is working on a “HWg-Push driver for Nagios” to connect LAN and GSM sensors. 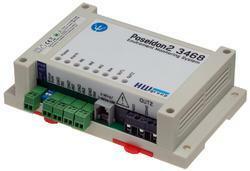 Poseidon2 3268: Ethernet I/O control and sensor monitoring system. 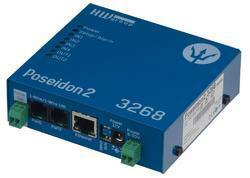 Poseidon2 3268 monitors sensors and controls I/O over a network. Logs data, alerts to high temperature, sends e-mails and can be connected to a cloud sensor system. Supports dry contacts (4x digital input), 8 external sensors and can control relay outputs (2x digital output). Supports M2M protocols – SNMP (SNMPv3), Modbus/TCP, XML, and the Sensdesk.com online portal. Up to 8 sensors, 4 dry contact inputs and 2 relay outputs can be connected. We supply temperature and humidity sensors (indoor/outdoor), light intensity sensors, DC/AC current and voltage converters. Digital Inputs can be connected to smoke detectors, power failure detectors, water flood detection, and more. E-mail and SMS alertsWhen a value is out of a specified range, Poseidon2 sends an e-mail, a SNMP Trap, or a text message (SMS). Text messages can be sent without any additional software. All HW group devices can send text messages (SMS) through a single central gateway, the HWg-SMS-GW. Just a single SIM card can serve all your devices. Sends an e-mail/SMS alert and turns on additional cooling or ventilation whenever the temperature is high. Detects open/closed door and controls the electronic lock. Monitors a remote environment, sensor values can be fed into any SNMP system. Enables remote reading of dry contact inputs and remote control of relay outputs (to turn on HVAC, restart a server, start a diesel generator, ...). Remote monitoring of dry contacts, 4-20mA probes or Pt-100 and Pt-1000 temperature probes. Measures temperature and humidity in a cooler or a freezer. When a value is out of a safe range, a relay output is activated to e.g. light up a warning light or sound a horn. Suitable for monitoring storages of food or pharmaceuticals. We recommend the PDMS software to monitor temperature. Poseidon2 can be connected to the SensDesk.com online portal. All sensors in an account can be viewed from anywhere using a web browser or a mobile app for Android and Apple. WEB-based temperature and humidity measurement with two Digital Inputs for dry contacts. Supports SNMP and the SensDesk online portal. Sends an e-mail when a contact is closed or the temperature is high. Supplied with PDMS – Windows software for producing MS Excel reports. Supports SNMP. Supplied with one temperature probe, power adapter and software. Web thermometer with two digital inputs for dry contacts. Sends an e-mail alert when the temperature is too high/too low or a contact is closed. Connected probes and detectors can be monitored using a Web interface or a mobile app. Comes with the HWg-PDMS software for Windows for displaying graphs and exporting data to MS Excel. 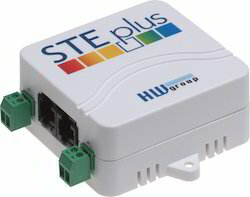 HWg-STE plus is compatible with SNMP and can be used with third-party applications. Connect several HWg-STE plus units to the www.SensDesk.com online portal. This works like a cloud application. Nothing to configure, no NAT or firewall. Simply activate the portal connection and you can check the temperature in your home under your desk, in your server room, or at your customer's site – no matter where you are. All your sensors are shown at a single screen in a mobile app. Remote alerting to rising temperature, humidity, open door or smoke. Monitor several IP sensors from anywhere using the SensDesk.com online portal and mobile apps. Supplied with an AC adapter, Windows software and one temperature probe. A second temperature probe can be connected. STE2: WiFi and Ethernet Thermometer with Digital InputsWiFi temperature and humidity sensor with two digital inputs for dry contacts. Connects to the network via WiFi or Ethernet with PoE (802.3af) support. STE2 wifi thermometer is supplied with a power adapter and a temperature probe. STE2 wifi and ethernet thermometer supports SNMP. STE2 online thermometer can be connected to the SensDesk online portal or to a SMS gateway. Three external temperature or humidity sensors can be connected to the STE2 wifi thermometer. The two green Digital Inputs can be used to connect e.g. a dry contact door sensor. Sensor readings and detector states can be monitored over the WEB interface to achieve an online thermometer solution. Text message (SMS) or email alert is sent if the temperature exceeds a specified limit or a contact is closed. A separate product, SMS gateway, is used to send text messages. Supports secure TLS email (SMTP TLS). STE2 wifi temperature monitor supports SNMP. With the HWg-PDMS software for Windows, data can be displayed in graphs and exported to MS Excel. STE2 wireless thermometer can be connected to the SensDesk.com online portal (and a mobile app). STE2 wlan thermometer is an ideal solution for wireless temperature monitoring in storages or coolers. WiFi interface allows for a fast and easy installation. We supply a wide range of humidity and temperature sensors. STE2 wifi thermometer sends an e-mail if a temperature is too high or a door is open (dry contact connected to a digital input is closed). STE2 is frequently used as a remote temperature sensor wifi / remote temperature monitoring device for remote environment monitoring and temperature alerts, e.g. in a computer room or a production facility. Digital inputs can be easily connected to a smoke detector, flood detector, door sensor, window sensor, vibration detector, PIR motion detector, and more. Poseidon2 4002 is a system for remote monitoring of rack environmental conditions (occupies 1U). Measures temperature, checks if the lights are on or the doors are open in the server room, and more. Relay outputs (4x digital output) can activate fans or an additional light. Poseidon is SNMP compatible, includes a data logger, e-mail and SMS alerts. It can be connected to the SensDesk online portal or cloud sensor systems. HWg-WLD is a network-enabled water leak detector with a water-absorbing sensing cable. HWg-WLD features a built-in web server, SNMP support, and e-mail alert to water flooding. HWg-WLD can remotely control a relay output over the network (a relay is switched when a water leak is detected along the sensing cable). 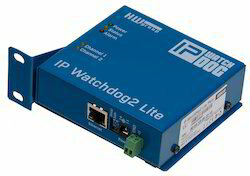 IP WatchDog2 Lite: PING restarter with SNMPIP WatchDog2 Lite monitors the availability of one or two LAN devices and automatically restarts them in case of failure. Unresponsive device (router, IP camera, WiFi AP, etc.) is detected by unavailable Web interface or no reply to PING. In such a case, IP WatchDog2 can reset the device and also alert the operator by e-mail or text message (SMS). 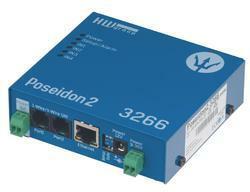 Poseidon2 3266 is a basic device for remote reading (monitoring) of sensors over the network. It measures temperature, voltage, and states of dry contacts (digital inputs) and other external sensors. It sends e-mail alerts to values out of a specified range, or connects to an environment monitoring system. Supports M2M protocols – SNMP (SNMPv3), Modbus/TCP, XML, and the Sensdesk.com online portal. 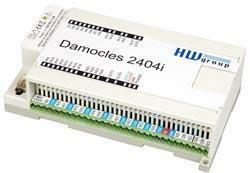 Damocles 2404i features 24 dry contact inputs and 4 relays controlled over an IP network (Ethernet). Includes a built-in web server, output control and alarm alerts (e-mail and SNMP trap). Outputs can be controlled manually in the web interface, or with M2M protocols (SNMP, XML, Modbus/TCP). 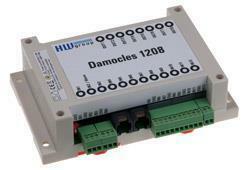 Damocles 1208 is a device with 12 remote inputs and 8 outputs over Ethernet with Web interface. M2M communication for connection to SNMP and SCADA systems. Pulse counters on digital inputs. E-mail and SNMP trap notifications of input state changes. Box-2-Box mode - outputs can be controlled over the LAN by another device. 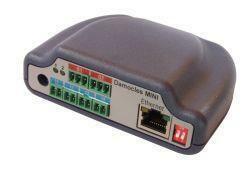 Damocles MINI is Web-relay with 4 digital inputs and control 2 NO/NC relay outputs over the Web and M2M (SNMP, XML, Modbus/TCP). Dry contact event email or SNMP Trap alert. 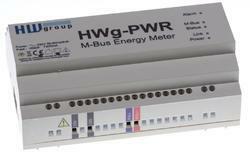 HWg-PWR is a smart Ethernet gateway for remote energy metering and consumption monitoring. To measure the consumption of water, electricity and other energies, external meters with the M-Bus interface are used. Up to 3 / 12 / 25 M-Bus meters can be connected to the HWg-PWR unit. Individual meters (electricity meter, water meter, gas meter, heat meter etc.) are produced by third parties and connected via their M-Bus interface. HWg-PWR is a smart gateway that monitors energy consumption and warns about abnormal values The unit provides a Web interface, charts, SNMP and Modbus/TCP output, data logging, e-mail and SMS alerts, and much more.